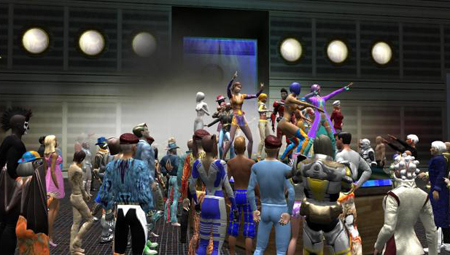 Publishers of the online game Entropia Universe have been granted a real-life banking license by Swedish officials. They plan to open a government-insured virtual bank for the game within a year. The sci-fi universe of Entropia already lets players exchange real money for virtual funds used to but items, business, and trade on the game's fictional world of Calypso. The game's currency, PED (Project Entropia Dollars), has a fixed rate with the US dollar, where 10 PED equals $1. With a banking license granted by the Swedish Financial Supervisory Authority, Entropia 's publisher MindArk gets government insurance on deposits up to about $60,000 for each customer. Gothenburg-based MindArk also plans to offer common bank services like lending, interest-bearing accounts, direct deposit of paychecks, and bill payment according to the Associated Press . Sinking astronomical amounts of cash into Entropia isn't unheard of. The game has twice entered the Guinness World Records for the most expensive virtual world items ever sold. In 2004, a 22-year-old Australian payed the equivalent of $26,500 to own a mutant-infested Treasure Island in the game. Later, the player Jon "NEVERDIE" Jacobs bought a virtual night-club asteroid for the equivalent of $100,000. Despite mortgaging his house to make the purchase, Jacobs claims to have made a profit on the deal by selling licenses to hunt monsters and mine resources on the asteroid. Unlike games that forbid exchanging virtual items and currency for real money, it's just a shave short of being required in Entropia for any advanced gameplay. Joining is free and doesn't require a monthly subscription, but players begin as colonist poppers on the world of Calypso with only a damaged jumpsuit and a pair of gray shoes to call their own. If they don't fork over real cash for a roll of PEDs, new players must attempt to eek out a living with (virtual) manual labor like the gathering and selling of fruit and dung for other players.